The Newbery-winning fantasy series now available in gorgeous new paperback editions! Since The Book of Three was first published in 1964, young readers have been enthralled by the adventures of Taran the Assistant Pig-Keeper and his quest to become a hero. Taran is joined by an engaging cast of characters that includes Eilonwy, the strong-willed and sharp-tongued princess; Fflewddur Fflam, the hyperbole-prone bard; the ever-faithful Gurgi; and the curmudgeonly Doli--all of whom have become involved in an epic struggle between good and evil that shapes the fate of the legendary land of Prydain. Released over a period of five years, Lloyd Alexander's beautifully written tales not only captured children's imaginations but also garnered the highest critical praise. The Black Cauldron was a Newbery Honor Book, and the final volume in the chronicles, The High King, crowned the series by winning the Newbery Medal for "the most distinguished contribution to American literature for children. "Henry Holt is proud to present this classic series in a new, redesigned paperback format. The jackets feature stunning art by acclaimed fantasy artist David Wyatt, giving the books a fresh look for today's generation of young fantasy lovers. The companion book of short stories, The Foundling is also available in paperback at this time. In their more than thirty years in print, the Chronicles of Prydain have become the standard of excellence in fantasy literature for children. 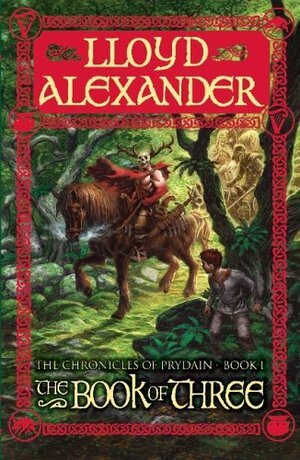 The Chronicles of Prydain is imaginative and unique. While the plot seems very straightforward, unlike many other fantasy novels with protagonists who long adventure, Taran's mistakes are not excused because of his youth- nor does Taran himself excuse his mistakes. Rather, Taran takes responsibility for his errors throughout the novel and it is extremely refreshing to see this in a fantasy novel, and very sad that it's not seen more often in more recent work. Alexander's writing style is concise and descriptive- detailing the character's surroundings without edging into purple prose. Alexander also does a wonderful job with the characters. All the characters end up having a key role in the narrative- ie Fflewddur’s experience as a king and his subsequent war prowess which lets the company buy time to escape from the Cauldron Born, Gurgi's man/beast nature and Eilonwy's talkativeness and courtly training. Each of the characters are unique in actions, thought process, and speaking patterns and they defy archetype characterization. Eilonwy as a character in partcular gets a shout out- her talkativeness is never used as a sign of vapidness or foolishness (in fact, it aids the protagonists at a key moment in the story) and her unique ways of using simile combined with her strong personality makes her quite a charming character. I also really appreciate the small crumbs of wisdom woven through the book- ie, how Dallben points out that Taran has to come to his own conclusion for it to have real meaning to him, the whole ‘a prince is not his trappings’ moment with Gwydion, kindness being more important than cleverness and the importance of taking responsibility for one's mistakes, to name a few. Many have compared Prydain to The Lord of the Rings. It is an apt comparison, but to claim that Prydain is 'a rip off' is simply absurd. Prydain is a coming of age tale, and the many comparisons made between the characters and plot simply do not fit, and it's rather clear that most are drawing from the film version of the LOTR books. Prydain is its own thing, and to dismiss it as a mere Lord of the Rings copycat is unfair to this masterpiece and to yourself.